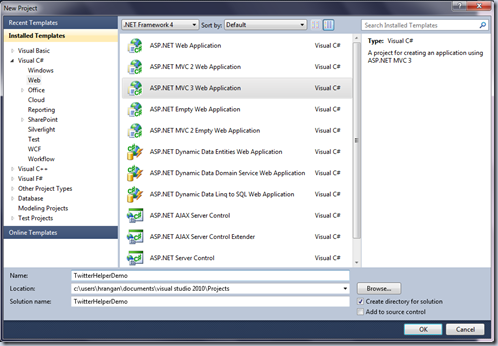 Much has been talked about the new release of ASP.NET MVC, i.e. MVC 3 and the new Razor syntax and the ability to simplify the development. Razor uses the @ prefix for switching between code and HTML and that kind of simplifies it when compared to using <%: symbol as with the case in MVC and ASPX engines. Not just that, Razor comes with a lot of goodies. The Helper classes simplify in doing some of the common tasks, doing common scenarios like integrating Twitter, Facebook or PayPal into your applications. 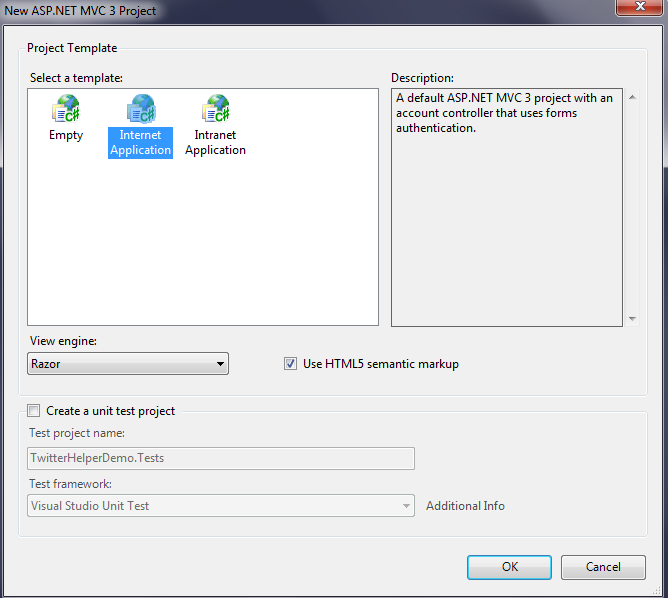 Visual Studio creates the skeleton project structure and scaffolds the default Home Controller and Account Controller. For the purpose of this sample, we will just use the Index.cshtml View which is under the Home folder under Views. 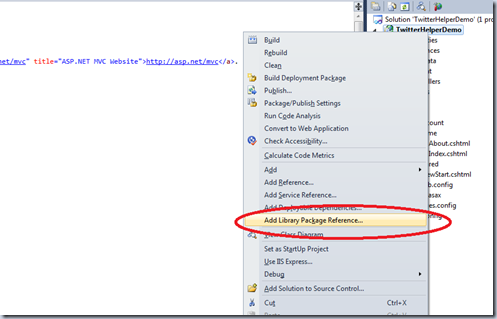 The “Add Library Package Reference” dialog opens up and lists the installed Helpers. Click on the “Online” tab and type “Twitter” in the search box on top right. It will try and find results online. 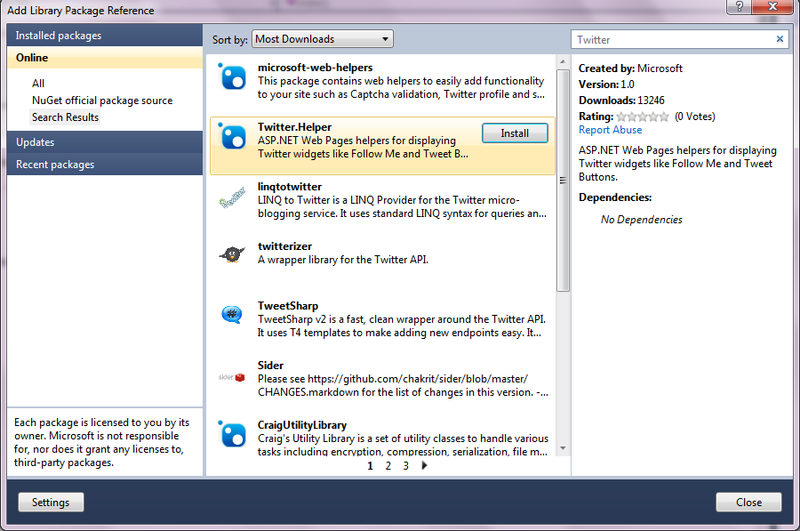 Choose the Twitter.Helper (click) and Install. It installs in a second and you can close the dialog. 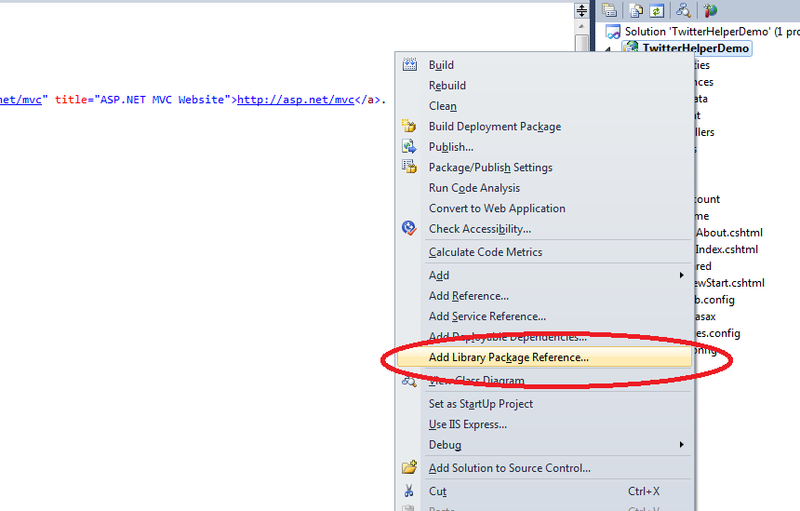 Next, open the Index.chstml file and remove the default “To Learn ASP.NET MVC” message within the paragraph. Start typing @Twitt and you should see intellisense for TwitterGoodies. When you run the solution, you can see the Twitter Profile loading and the latest tweets showing up. 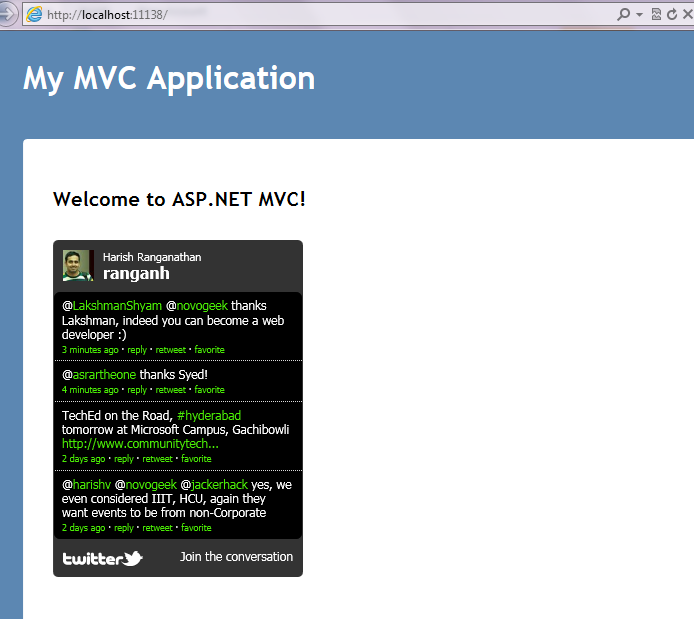 This way, we can simply integrate Twitter into your ASP.NET MVC 3 Application. I was trying to use this with Silverlight, but not getting the reference. 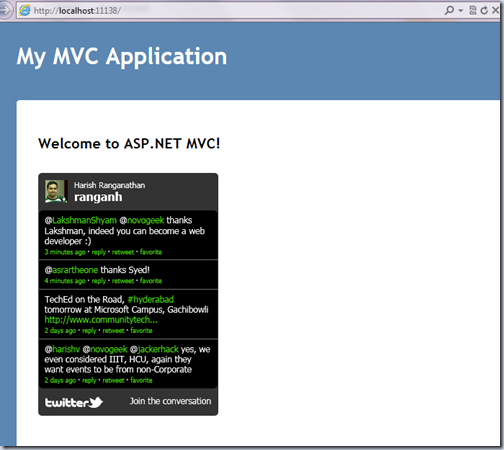 Does it has any limitation that it will work only with ASP.NET MVC and Razor ? Good to know it... thanks for the tips.. but I also have the same question added before.. does it have any limitation?? 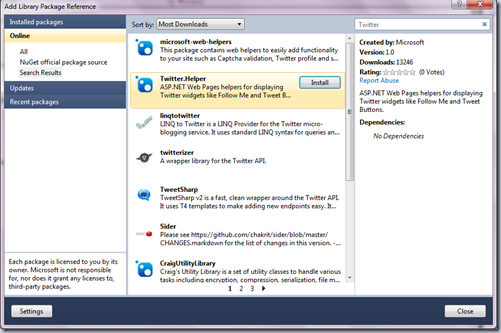 Microsoft has intrduced twitter control in ajax control toolkit in asp.net 4.0, september release 11. This is awesome! Thanks man. I followed each step, but i am not getting my profile. My browser open the index page and the page do not show my profile. Please help me. I have tried intergrating both the apps but each time I try i face error message pops up .I want the problem to be fixed soon. Please help me. 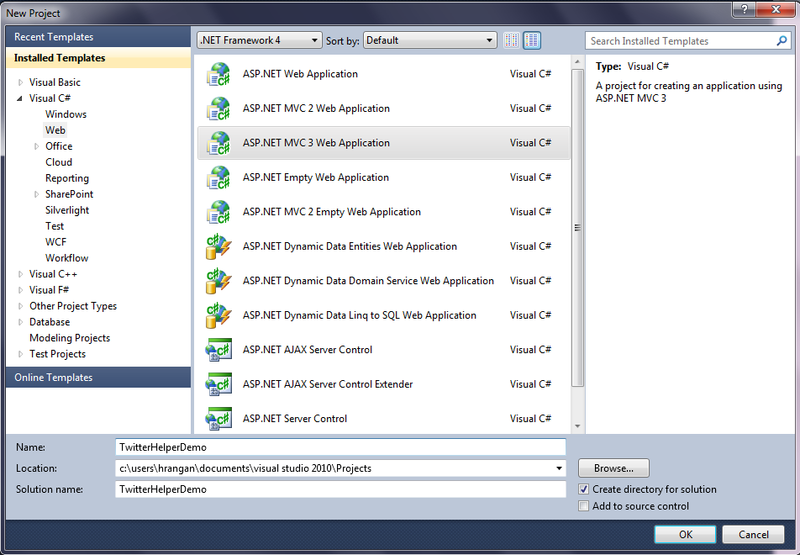 I have downloaded the new version of ASP.NET and I hope it works now.